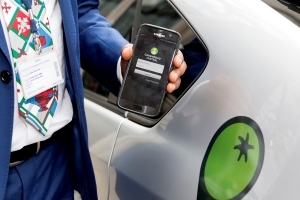 Greentomatocars, London’s largest green private hire service, is giving passengers safer and more comfortable journeys thanks to a sophisticated system that warns drivers when they stray from good practice. GreenRoad’s driver safety system monitors more than 150 different movements and detects when a driver performs a manueuvre such as sharp cornering, swerving, harsh braking or sudden acceleration. Drivers can monitor their driving via a simple to use dashboard tool, so they can improve their skills, encouraging good driving habits on a daily basis. Drivers are alerted by a simple ‘traffic light’ system that sits on the dashboard – a green light means driving is safe, amber that it is straying away from the safest driving practices and a red light indicates that a risky manueuvre has just been undertaken. Greentomatocars already prides itself on the safety of its drivers but wanted to promote a culture of continual improvement so installed GreenRoad’s performance management system in 300 of its vehicles this year. Installing the system was straightforward, with all 300 vehicles being equipped within a fortnight earlier this year after a successful trial was concluded. Chris Horbowy, GreenRoad’s Director of UK Sales, said: “We are delighted that greentomatocars has chosen GreenRoad and believe that thousands of its customers will enjoy safer, smoother journeys thanks to our system. GreenRoad was established in 2004 to help companies improve driver safety and reduce overall costs and risks. Since then the company has monitored over 6 billion miles and more than 500,000 driving years. GreenRoad engages drivers directly to generate meaningful, lasting change through real-time, in-vehicle feedback and highly effective change management methodology. For more information, please visit www.greenroad.com, and follow GreenRoad on Twitter, @GreenRoadNews. For further information pleases contact Celeste Clarke at Century PR on 024 7622 8881 or email celeste@centurypr.co.uk.